by author Jean Marie Santal . Geneva has been for a long period the Swiss automotive capital of industry and sport. 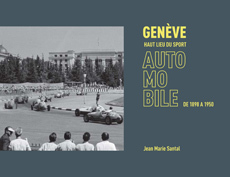 The present book starts with the creation of the Automobile Club Suisse (ACS) in the year 1898 and ends 1950 with the last Grand Prix held in Geneva. Fangio was then victorious with an Alfetta 158. The first industrial efforts and the men supporting the beginning of the automobile age are well described as well as the first racing events at Geneva or around. The book covers also the 3 Grand Prix which took place after the war in the middle of the city. Romain Grosjean, the Formula 1 pilot tell us in the end note his feeling about the racing in the previous day and the today situation. Limited Edition to 500 copies for sale.